The mesmerising appeal of Kashmir has charmed people down the ages. Seema Sachdeva writes about this picturesque Valley which has lured poets since time immemorial. "If there is a Paradise on Earth, it is here, it is here, it is here" These immortal words describe the ethereal beauty of Kashmir. As one thinks of the picturesque Valley, images of a ride in a shikara, gorgeous houseboats, shops for priceless artefacts and handiwork come to the mind. The 300-km drive from Jammu to this Valley is full of breathtaking sites and scenes. 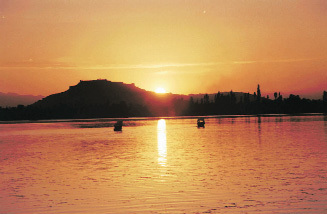 Srinagar brings about a distinct flavour of the glorious past with centuries-old buildings adorning the city. As you approach the majestic Dal Lake, thousands of houseboats made of ornately carved cedar wood welcome you. Although there are a number of hotels for tourists yet the temptation to live in a houseboat is hard to resist. You need to hire a shikara to take you to the houseboat. The houseboats, which come with three to four bedrooms, attached bathrooms, drawing and dining rooms look like relics from the British times. These architectural wonders are not only well-furnished and equipped with modern gadgets, but also have electricity and telephone connections. The appeal of staying in a houseboat lies in the fact that it provides an unobtrusive view of the mountains enhanced by the calm of the beautiful lake. It is believed that an edict of a Dogra king that no outsider or foreigner can buy immovable property in the Valley led to the birth of a houseboat. In 1888, an Englishman, M. T. Kinnard, outsmarted law by purchasing a flat-bottomed boat and turned it into a moored home on water. How can you be in Srinagar and not take a ride in the beautiful shikara to explore the enchanting Dal Lake? A ride in a shikara can cost between Rs 100 and Rs 500, depending on the scenic spots you want to visit. While you laze around taking in the beauty of the lake, you can try your hand at shopping for knick-knacks. There are a number of vendors selling local handicrafts and papier-mâché products. A home to various communities, the lake is not merely a lifeless body of water. It is a source of income not only for the houseboat owners but also for the shikarawallahs and vendors thronging the area. Among the spots where a shikarawallah could take you to is the Charchinari, a small island on the lake named after its four chinar trees. These trees on the vast stretch of water look as if they are guarding the lake. The celebrated chinar trees here and all around Srinagar were brought from Persia. To this day, these trees are found only in these two places. Besides the Dal Lake, the Mughal Gardens is a prime attraction. Of the two gardens, Shalimar sits serenely shaded by the giant chinars. It is believed that these trees were planted by Emperor Jahangir himself. 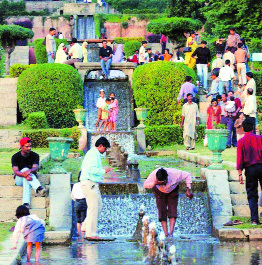 Nishat gardens is build on steps cut into the hillside. Another must-visit is the Cheshmashahi, which is located at a height. The water of the spring is famous for its medicinal value. The tourists make it a point to take some of this water. Close by is the Hazratbal mosque in pure white marble. The mosque enshrines a hair of Prophet Mohammad kept as a relic. At the other end of the lake is the Adi Shankaracharya hill with its historic Shiva temple on the top. The site is believed to date back to 2,500 B.C. Fiftythree km from Srinagar is Gulmarg. The mesmerising beauty of this huge cup-shaped meadow of flowers, ringed by lush green pine trees and snow-clad mountains on three sides, has inspired a number of Hindi movies. Gulmarg has a circular 11-km road called the mall which runs through pine trees. The town, which can be best explored on horseback, is unique in the sense that it has no local population at all. This makes the place noise-free and peaceful at night. The distant stars shining in the sky are disturbed only by maybe the squealing of a wild animal. The ride in the famous Gondola cable car in Gulmarg can get you a breathtaking view of the Valley and the Alpathar Parvat. Based on French technology, the Gondola has more than 40 cable cars operating simultaneously. Years of militancy in the Valley may have left Kashmir far behind other hill stations like Shimla, Manali or Mussorie in terms of development and tourist inflow, yet a positive fallout of this has been that it has been not touched by commercialism. The raw beauty of nature, the green chinars, the huge pine and deodar trees remind us of the treasure we have. It is hard not to fall in love with the pristine beauty of the Valley.